To keep the costs of our naturist paradise at an acceptable level the following rates are charged for a stay at Il Cantico. And besides that a few conditions are relevant in order to secure the privacy of our guests. The whole year around you can pick lemons in the orchyard. During the winter and early spring oranges and mandarins are fresh from the trees. 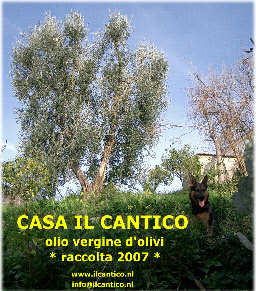 Almost every year after the december harvest we have about 150-250 liters olive oil of supreme quality for sale at € 12,50 per liter at Il Cantico. small extra tent €5,- per child till the age of 14; older children are charged as adults: €17,50 per night! It is almost impossible to reach our enclosure with other than the smallest caravans and mobile homes. Please contact us in advance!! In 2017 we welcome guests from the beginning of May till the end of September; the high season is from mid-June till the end of July. Naturism is the way of living at our enclosure; when you cannot stand naked people you ‘ll not feel at home with us! Your stay on our site is “at your own risk”; we are not responsible for any damage etc.